The United States government has made it easier for smaller companies to access finance by firstly lowering the requirements for smaller firms to list on the stock exchange (as an initial public offering) and secondly by crafting new rules which make it easier for ordinary citizens to invest in companies via crowdfunding. They have already led to an increase in the initial public offering (IPOs) by smaller firms. The new rules are contained in the Jumpstart Our Business Startups (JOBS) Act, introduced in 2012. They contain three initiatives, namely: legalising equity crowdfunding, expanding “mini-public offerings” and creating an “IPO on-ramp” consistent with investor protections. When signing the act, US President Barack Obama termed the provision “a potential game changer” for American start-ups by democratising investment so that more entrepreneurs will have greater access to capital. Up to the end of 2015 the biggest impact the act has had is on having made it easier for young high-growth firms to go public by providing an incubator period for a new class of “Emerging Growth Companies”. During this period, qualifying companies are allowed time to reach compliance with certain public company disclosure and auditing requirements after their IPO. Any firm that goes public already has up to two years after its IPO to comply with certain Sarbanes-Oxley auditing requirements. The act extends that period to a maximum of five years, or less if during the on-ramp period a company achieves $1 billion in gross revenue, $700 million in public float, or issues more than $1 billion in non-convertible debt in the previous three years. Many believe that the act’s confidential registration statement filing procedures have been a key element of its success. The provision allows issuers to file their registration statements with the Securities Exchange Commission (SEC) on a confidential basis. They can then get the registration statement in order before releasing it. The act also made it easier for small firms to list (termed a “mini-IPO”) by raising the ceiling for the existing “Regulation A” exemption from certain SEC requirements. Previously only those seeking to raise less than $5 million in any 12-month period could access it. But the regulation was seldom used. The act raised this threshold to $50 million. The final rules for Regulation A exemption (referred to as Regulation A+) came into effect in June 2015. A 2014 study by Latham & Watkins found that 85% of IPOs are by emerging growth companies another (they made up 75% in the act’s first year and just half 50% of IPOs in 2012 ). A further study by the State University of New York at Buffalo and Pennsylvania State University said controlling for market conditions, the JOBS Act has led to 21 additional IPOs annually, a 25% increase over pre-JOBS levels. In November 2015 SEC Chair Mary Jo White said the on-ramp provision has likely been the most successful portions of the act. Since it came into force about 1 000 such companies have taken advantage of that process and confidentially submit draft registration statements for IPOs. In October 2015 the Securities and Exchange Commission (SEC) voted to approve a final rule implementing a key provision of the act, which will, for the first time, create a national framework for securities-based crowdfunding to allow entrepreneurs to raise up to $1 million in the period of a year from regular investors annually through regulated online platforms. The provision is set to comes into effect in April 2016. Crowdfunding is expected to surpass venture capital funding in 2016, with $34 billion a year lent out across all types of crowdfunding. As equity crowdfunding with non-accredited investors under Title III comes into effect, it will have massive implications for startups and investors alike, allowing everyday citizens to invest in startups and making available a significant amount of capital to early-stage companies. This marks the first time in over eighty years that everyday citizens will have access to investing in early stage companies. In the 1980’s, you had to call your stockbroker if you wanted to purchase shares on the public markets, and pay them big fees just for taking your order. Following this wealthy institutions, VCs, and Angels have had exclusive access to investing in high-growth start-ups. To guard against abuse, certain investor protections have been built into the crowdfunding rules. Transactions must take place through SEC-regulated intermediaries, which will help ensure that companies make required disclosures and that regular investors abide by limits on how much capital they are able to put at risk. Investors making up to $100,000 per year can invest the greater of $2 000 or five percent of their annual income, while investors making over $100,000 per year can invest up to 10% of their annual income. Some however do not forecast sharp growth for crowdfunding, at least for the first few years, partly due to regulatory costs. But while intermediaries and brokers will be allowed to take commissions, some believe that costs will eventually come down either through technological solutions or by issuers moving intrastate crowdfunding markets, where disclosure rules are more forgiving. 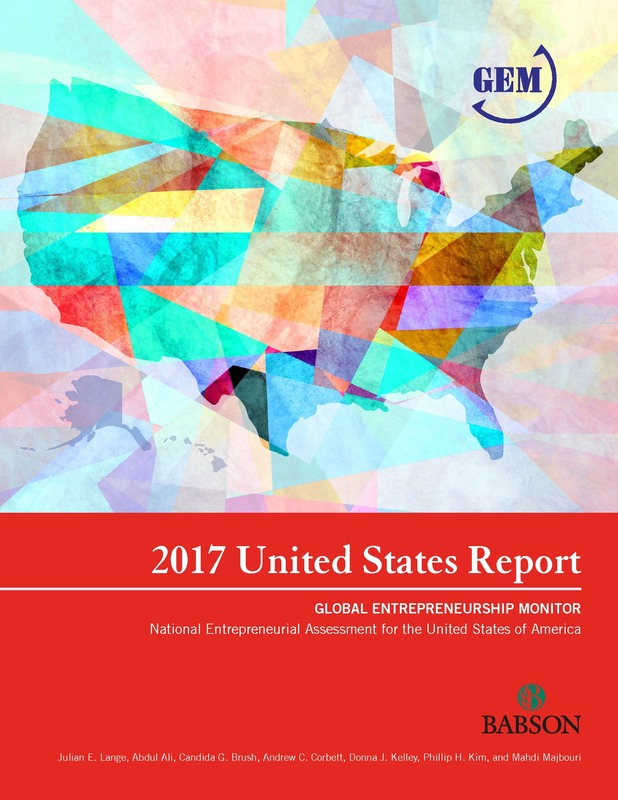 After experiencing a marked decline in 2009 and 2010 in the wake of the 2008 recession, entrepreneurship is climbing again in the United States, with the percentage of adults in 2014 involved in new and young firms reaching the highest rate (13.8%) in 16 years. 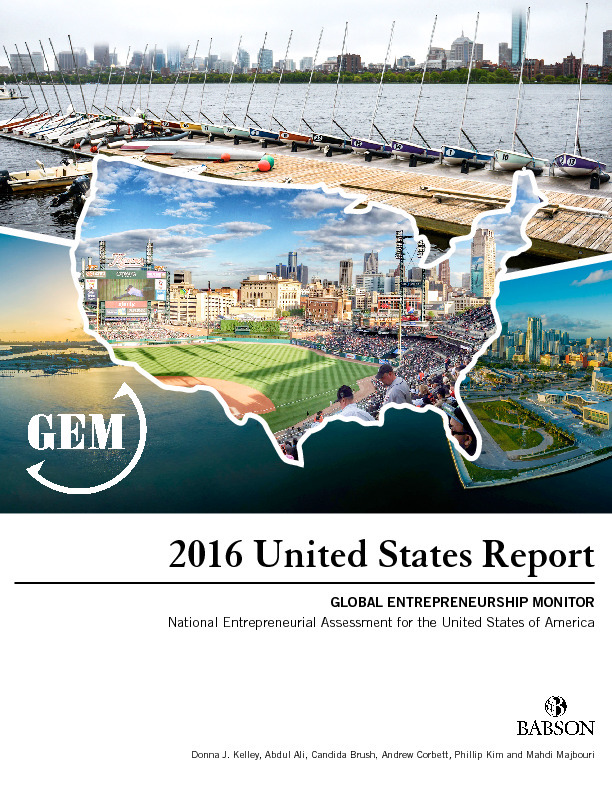 Compared with the average for 28 other advanced economies in the 2014 GEM survey, American entrepreneurs often operate in knowledge and service-intensive sectors, including launching medium and high technology businesses. Additionally, they are highly likely to create jobs for others and introduce innovative products and services. This combination of high rates and high impact reflects the value of policies that promote entrepreneurship in the United States. The year 2017 was prosperous and calm for the U.S. economy. Almost all economic indices performed well. The average annual growth rate was 2.27%, and the seasonally adjusted annualized growth rate surpassed 2% in all but one quarter of the year. Fifty-seven percent of Americans see good opportunities around them for starting a business. 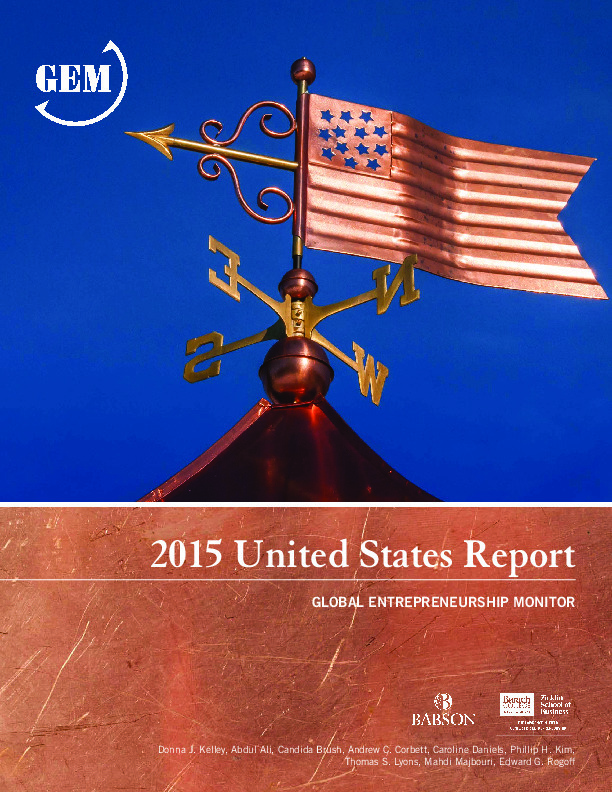 U.S. entrepreneurs are also driven most by opportunity (88%). U.S. entrepreneurs are twice as likely to compete in the finance sector compared to the average innovation-driven economy. While the 26 other innovation-driven economies demonstrate their highest total entrepreneurial activity (TEA) among 25-34 year-olds, the U.S. actually peaks in the next oldest age group, among the 35-44 year-olds. More women entered entrepreneurship last year than the year before, while this level has remained the same for men. Opportunity perceptions dropped from a high of 51% in 2014 to 47% in 2015. This is the first drop since these perceptions began to rise in 2010. While the United States reports the highest level of capability perceptions (56%) at the innovation-driven development level, one-third of these economies report higher opportunity perceptions than the United States. This suggests that Americans remain highly confident in their abilities to start a business, but are seeing fewer opportunities to do so. 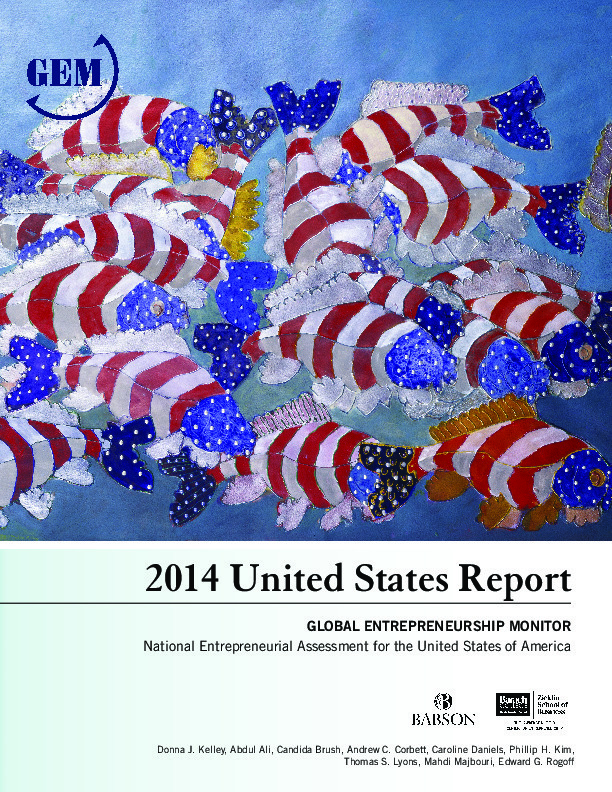 Entrepreneurship in the United States in 2014 involves high participation across each phase of the process, and it is accompanied by high levels of employee entrepreneurship activity. High impact is evident in the industry makeup, and in growth ambitions and innovativeness of American entrepreneurs, although low internationalization may represent missed opportunities. Positive attitudes about entrepreneurship are reflected in societal support for this activity, yet Americans show declining personal interactions with entrepreneurs over time. Analyses of women and of older and younger populations show the particular nature and needs of different groups. The United States economy has been experiencing a slow recovery since The Great Recession (the financial crisis) and 2013 is not an exception. There are, however, developments that make 2013 different. Wall Street rallied throughout 2013, ending with one of its best years in recent times. The Dow Jones Industrial Average rose 26.5% (from 13,104 to about 16,577), its largest rise since 1989, and the S&P 500 rose by 32.4%, its largest increase since 1997. The unemployment rate, although still more than 6.5%, showed the largest annual drop since the recession. Health care costs exhibited smaller increases in 2013 and new housing starts reached an all-time high since the Great Recession started in November 2007.